Hailed as “a tremendously entertaining heart-felt comedy” (Julian Roman, Movieweb), director Alexander Payne’s (The Descendants, Nebraska) hilarious DOWNSIZING arrives on 4K Ultra HD, Blu-ray, and DVD March 20, 2018 from Paramount Home Media Distribution. The film arrives on Digital March 6. 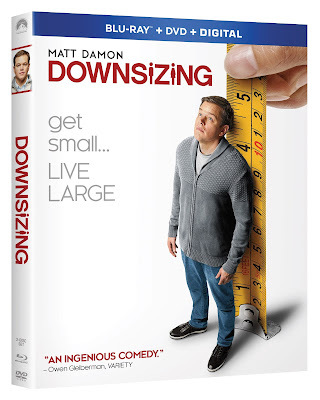 When scientists find a way to shrink humans to five inches tall, Paul Safranek (Academy Award winner** Matt Damon) and his wife Audrey (Kristen Wiig) decide to ditch their stressed out lives in order to get small and live large in a luxurious downsized community. Filled with life-changing adventures and endless possibilities, Leisureland offers more than riches, as Paul discovers a whole new world and realizes that we are meant for something bigger. “Brilliant and daring” (Shawn Edwards, Fox-TV) and “full of surprises” (Noah Gittell, Nerdist), DOWNSIZING also stars Academy Award winner Christoph Waltz and Hong Chau in a breakthrough performance that earned her Golden Globe and SAG nominations. The DOWNSIZING 4K Ultra HD and Blu-ray Combo Packs include nearly an hour of fascinating bonus content with six behind-the-scenes featurettes. Join the incredible cast including Matt Damon and Kristen Wiig, plus Academy Award-winning director Alexander Payne to see how his unique vision was brought to life. Take a journey on set and check out the production design and visual effects behind the miniaturized world of Leisureland, and much more! Fans can enjoy the ultimate viewing experience with the 4K Ultra HD Combo Pack, which includes the Blu-ray Disc™ detailed above, as well as an Ultra HD Disc presented in 4K Ultra HD and English 7.1 DTS-HD Master Audio, Czech 5.1 Dolby Digital, French - Canadian 5.1 Dolby Digital, French - Parisian 5.1 Dolby Digital, German 5.1 Dolby Digital, Italian 5.1 Dolby Digital, Polish 5.1 Dolby Digital, Portuguese - Brazilian 5.1 Dolby Digital, Russian 5.1 Dolby Digital, Spanish - Castilian 5.1 Dolby Digital, Spanish - Latin American 5.1 Dolby Digital, and English Audio Description with English, English SDH, Arabic, Bahasa – Malaysian, Cantonese, Simplified Chinese, Mandarin, Czech, Danish, Dutch, Finnish, French - Canadian, French - Parisian, German, Greek, Hebrew, Hindi, Icelandic, Italian, Korean, Norwegian, Polish, Portuguese - Brazilian, Portuguese - European, Romanian, Russian, Slovakian, Spanish - Castilian, Spanish - Latin American, Swedish, Thai and Turkish subtitles. The Combo Pack also includes access to a Digital HD copy of the film. The DVD is presented in widescreen enhanced for 16:9 televisions with English 5.1 Dolby Digital, French 5.1 Dolby Digital, Spanish 5.1 Dolby Digital and English Audio Description and English, French, Spanish and Portuguese subtitles. The disc includes the feature film in standard definition.